Dermatopathology is pattern recognition. From that perspective, a dermatologist is uniquely qualified to excel in this specialty. The key is to adapt the same skill sets that enable you to recognize clinical disease patterns and apply it to the microscope slide. It may take some of you more time to master the basic skills of reviewing a dermatopathology slide, but don't worry, you will all reach this goal! The secret to learning dermatopathology is to view microscopic slides with a clinical eye and to view clinical lesions with a microscopic eye. Play to your strengths and use your clinical skills! For example, if the lesion is an infiltrative and indurated plaque on the face of an adult woman, your clinical differential diagnosis would include granuloma annulare, sarcoidosis, granuloma faciale, an adenxal tumor, and a lymphoma. With that clinical information as your background, look at the slide and ask yourself whether the histopathology matches any of your leading clinical impressions. You may easily eliminate these broad categories of disease and narrow your differential diagnosis. The converse is to view a microscope slide and extrapolate what the lesion may have looked like on the patient. 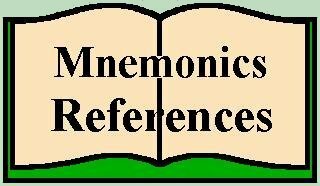 Is this a young patient, an old patient? 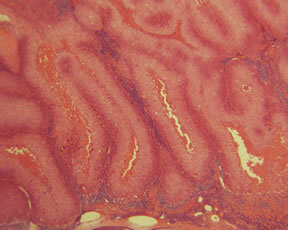 Is it acral skin or a mucosal surface? Is it an acute or chronic process? You may not recognize all of the histopathologic patterns you are viewing but by discerning where the lesion is arising and what the clinical apperance is, you can again utilize your clinical skills and arrive at a reasonable differential diagnosis. Start with the Primer of Dermatopathology presentations which provide a broad introduction to dermatopathology. Once you are comfortable, move on to the differential diagnostic patterns. These provide a broad framework to categorize dermatopathology lesions and help to quickly generate a differential diagnosis based only upon the histopathologic pattern. 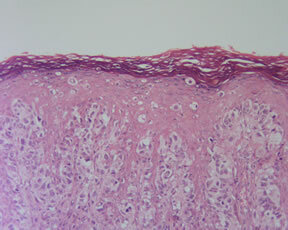 Challenge yourselves with the weekly unknown slides and always have a good dermatopathology textbook at your side. Finally...enjoy! Dermatopathology completes your dermatology education and may encourage some of you to rethink core principles of dermatologic diseases. It is my earnest desire for all of you to experience the same elation that I have when a new and fascinating chapter in dermatology is unvieled as a novel observation is rendered for the first time from the microscope slide. 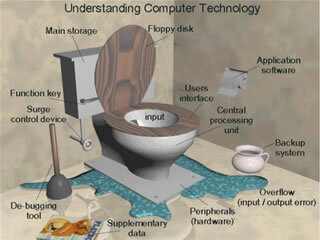 These presentations are stored as Adobe PDF files and you will need a reader to access these. A Primer of Dermatopathology We've Only Just Begun! 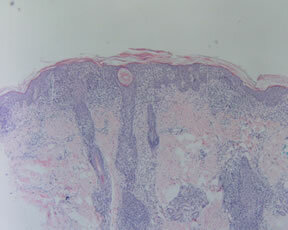 The following presentations are intended as an overall review and introduction to Dermatopathology. Dermatopathology: We've Only Just Begun! The Quest for the Ultimate Special Stain-Revealed! Titles that are marked with an asterisk (*) are part of the "must know" patterns for dermatology boards.